Marc’s talking about the girls, of course, buried inside every painting. Other than me, only he knows about their existence. The only thing I haven’t told him is why, fifteen years later, I continue to make them vanish over and over. One of the scariest times of my life was the very first time I went away to summer camp. My mom sent me away from home for two weeks to some secluded lake with no one else I knew. She obviously didn’t love me! Well, that’s what I thought at first. I ended up having a blast and I went back several times after that. I learned a lot of things about social dynamics during those trips to camp – even more so than I learned at school. Because at away-camp, you are living with these people. It’s a forced family where you have 100 siblings or more and you have to learn how to deal with many of them in very close quarters. Riley Sager’s new book certainly took me back to that time in my life when I was nervous about being away from home and about fitting in, but it also reminded me that I had to grow a thick skin quickly in order to avoid being eaten alive by the other kids (and the mosquitoes!). Maybe it’s because I grew up in a different era when kids were kids and not just miniature adults, but the girls in this book’s Camp Nightingale felt very distant from my own personal camp experience. Although their eventual fate remains a mystery, I’m certain that what happened to those girls is all my fault. Emma Davis returns to the summer camp of her youth primarily to help its owner, the now elderly Frannie Harris-White, revive the camp. But Emma also returns to banish the demons that have haunted her with guilt for so long. The only way to do that is to solve the mystery of three girls who went missing at Camp Nightingale 15 years ago. See the full book blurb here. Girls at summer camp, a mystery, a secret journal, the handsome son of the camp director – those are ingredients for an intriguing story, right? Toss in dual timelines, a narrator who is only partially reliable, and a campground with a spooky backstory and you should have the recipe for a perfect summer read. Unfortunately, this final dish was less than perfect. A sense of isolation drops onto your shoulders, and for a moment you wonder if the whole camp has cleared out, leaving only you behind. More horrible scenarios fill your thoughts. Cabins emptying in a frenzied, worried rush. You sleeping right through it. The story started off well enough, but then it gradually started to suffer from cliched characters (the mean girl, the know-it-all, the fake-nice gold-digger, etc.) and repetitive action in both the past and present timelines that ended up reading as dull and lacking creativity. One example: Emma was there to run a painting class for the girls in the camp. She actually only ends up teaching one class (maybe two?). What’s the point? There ended up being several “what’s the point” moments that followed key plot points making the book lose more than a little credibility. Although the premise was interesting and had loads of potential, the buildup never took off and the effort Sager expended toward a twisty ending was totally lost on me. And the ultimate wow-did-that-just-happen-moment? Nope, I just didn’t buy it. Fans of his debut novel, Final Girls, tended to rate The Last Time I Lied much higher than I gave it credit for. They loved the action and thought the ending was sufficiently twisty. As always, judge for yourself. I am not disappointed that I read it, I just wish it had been more of what I was expecting from a sophomore effort. 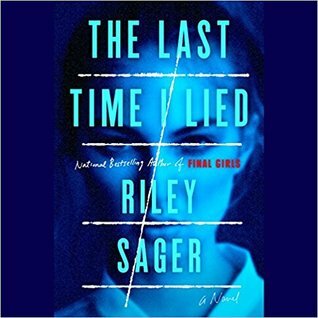 Riley Sager is the pseudonym of a former journalist, editor and graphic designer. Now a full-time author, Riley’s first thriller, FINAL GIRLS, was a national bestseller that has been published in 25 languages. His latest book, THE LAST TIME I LIED, was published in July.